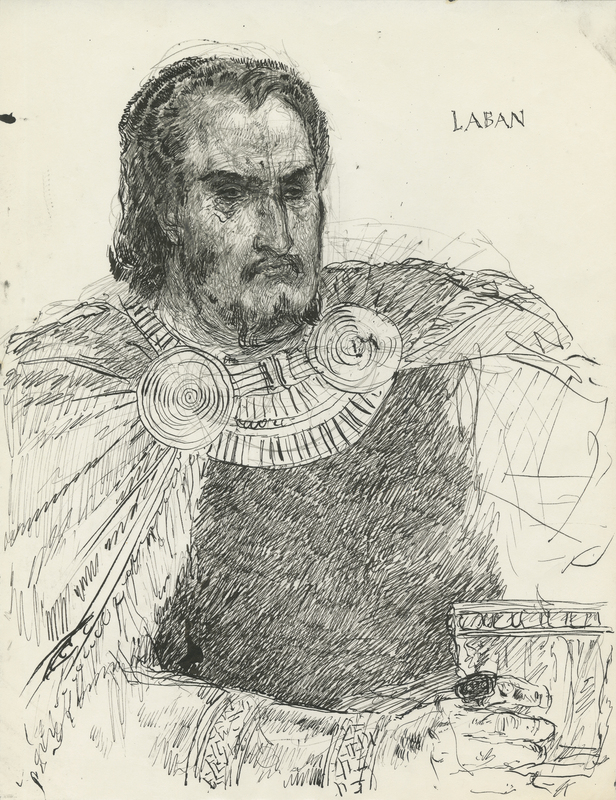 Book of Mormon Central / Archive / Sketch of "Laban"
Here, Friberg depicts the first and perhaps only portraits of the Book of Mormon’s first villain. Little is known of Laban. According to the first book of Nephi, he was a relative, an important member of Jerusalem’s leadership, and the keeper of the brass plates, which contained a genealogy of Nephi’s family and the writings of Jewish prophets. Friberg shows Laban at the moment Nephi and his brothers, Laman and Lemuel, unsuccessfully barter for the brass plates. Refusing their generous offer, Laban instead accuses them of attempting to rob him. Friberg shows Laban wearing the clothing of an important man, holding a luxurious goblet—his downfall is later precipitated by drunkenness— and leaning forward with an aggressive pomposity.